Sure, I could order it, but at special order price? Heck no. So my brain reminds me that in shop class way back in high school our instructor told us that table saws can be set-up to run the board at an angle to the blade, creating a cove. So I went to YouTube to find some tutorials. This video was my favorite, it was less guess & check and more technical to get the right angle to get the exact cove I want. It basically consisted of clamping a long fence at an angle to the blade, and tightening a featherboard on the opposite side to keep the piece tight against the fence. Then let her rip! It took several passes on each board, starting by just shaving off a hair the first pass, and slowly raising the blade each time. The trick was keeping the board pushed down on top of the blade, as they kept wanting to raise. In total it took about an hour to cut the cove on 4 boards. And the pile of sawdust was pretty impressive. After cutting the cove, I cut a 45 degree miter off both the top and bottom edges of each side, so that the board would sit up against the corner of the ceiling & wall. I really didn’t take any photos of this step, it was pretty dusty. 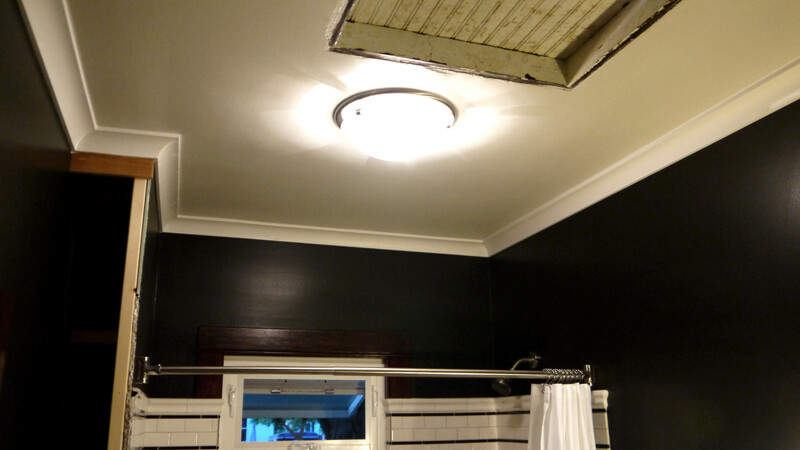 I needed just about 36 feet for the entire perimeter of the bathroom, so I simply used 1″ x 4″ pine boards. Although I stripped the paint and re-stained the woodwork around the door & window, I knew from the get-go that the crown would be painted white. I want it to feel like part of the ceiling. 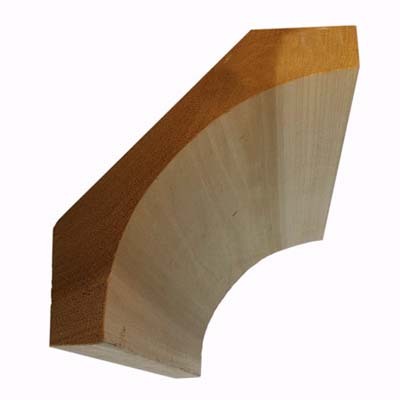 Even by running the boards a second time across the blade without raising it, each board still had kerf marks along the entire length of the cove. This meant first scraping the cove with a metal scraper, and then lots and lots of sanding. I actually wrapped sandpaper around a short length of 3″ PVC pipe to sand the cove, and then sanded the mitered edges too. 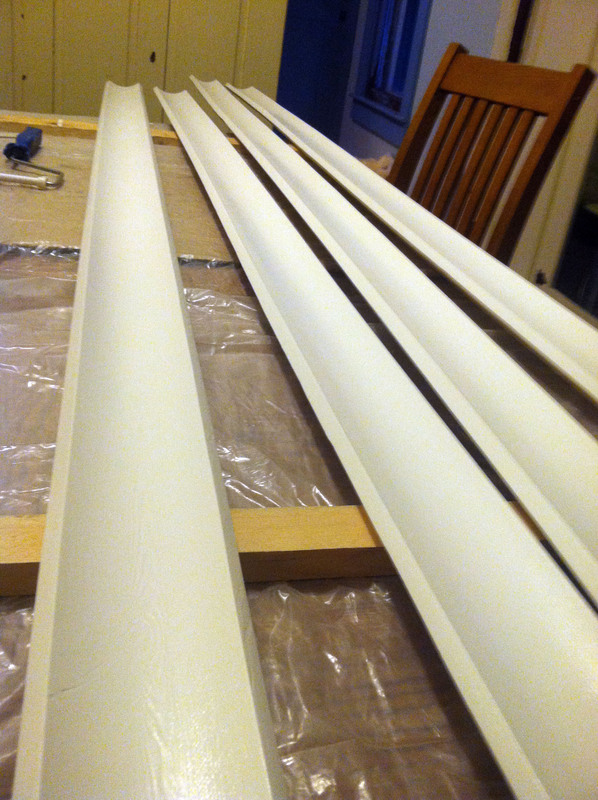 A coat of primer and 2 careful coats of Sherwin Williams Pro-Classic (supposed to be the best latex enamel on the market, drying to a hard finish recommended for trim and cabinetry). I also added a measured amount of Floetrol to the paint. Floetrol is a paint additive designed to slow the drying time to make sure the paint levels as it dries. This helps eliminate any brush or roller marks. 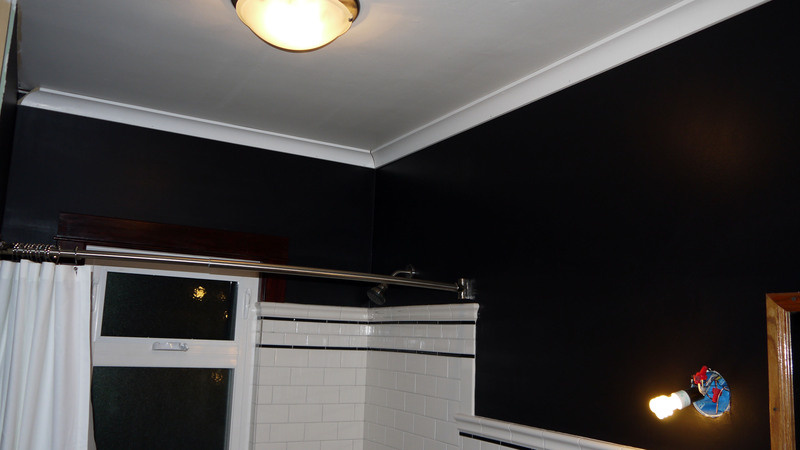 The results were worth all the work – they looked like factory finish trim boards! Then measure, mark, measure, and cut. And then cut again, because with crown molding I always forget that by holding the board up against the miter saw fence it is upside down. So it’s a mental game to get it just right. Luckily I only made the wrong angle cut twice, each on the first end of a board and not when the measurement had to be exact. One wrong cut and it’s very easy to be stuck with a piece 2″ too short. The first few walls were pretty simple. The corners seemed to line up alright, and the walls were pretty flat. Then came the corner of the South wall, where I kept the original plaster. Apparently it is not an exact 90 degree angle. No surprise there though. And lots of nail holes to try to get the cove molding as tight as possible to both the ceiling and wall. Once all the pieces were hung, then came filling every nail hole, corner, and seam along the ceiling with white paintable caulk. I put the priority on getting the trim tight to the wall, and it worked pretty well. 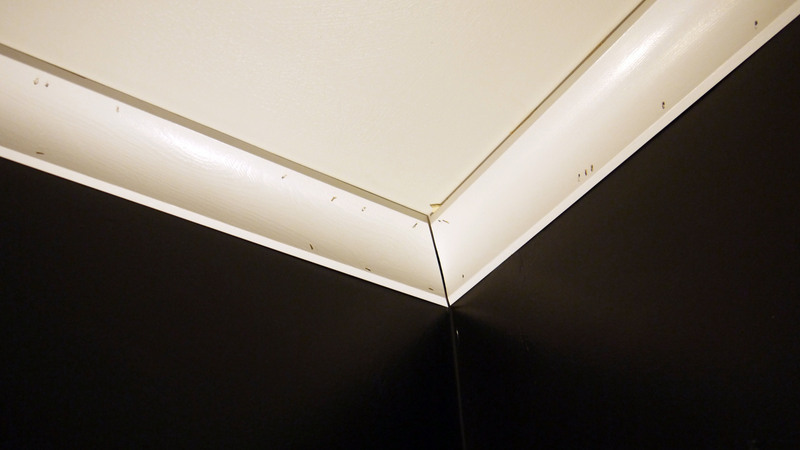 This way I could use caulk in the seam where it meets the ceiling to fill any gaps and not have to do this along the black paint. I still have to go back for touch-up painting the spots where I caulked, but I’m thrilled with how it turned out. It looks much more elevated than any other room in the house. A touch of class in a classic bathroom. 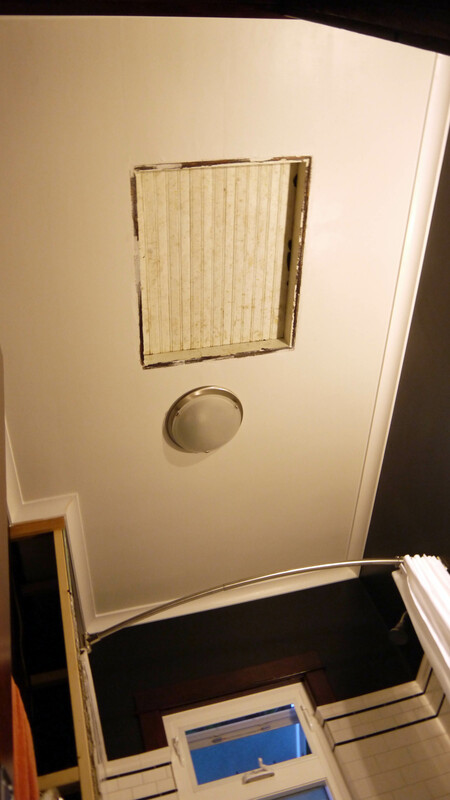 And then the ugly attic access. 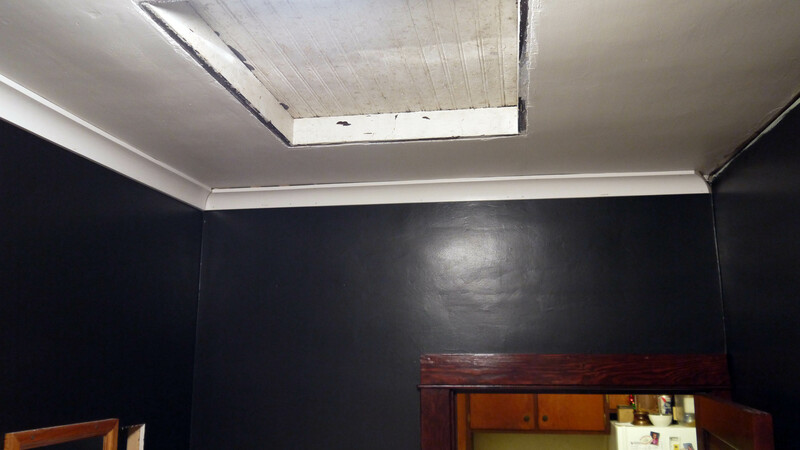 Eventually that will be painted the same enamel white along with the narrow trim around it, and won’t be such an eyesore in the middle of the ceiling.